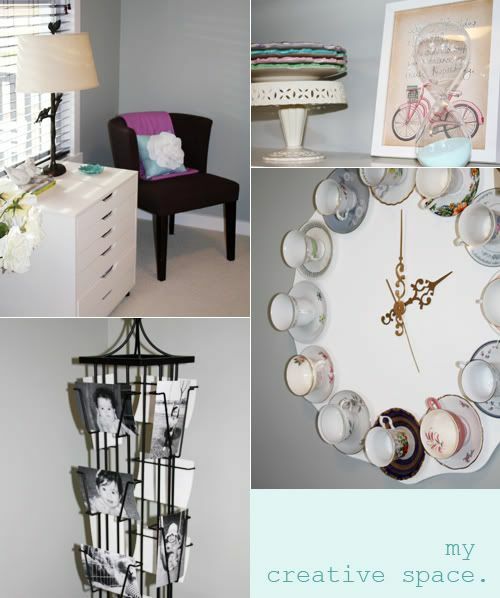 Daffodil Design - Calgary Design and Lifestyle Blog: things i love tuesday. my creative space. things i love tuesday. my creative space. my office. my sewing room. my drawing room. all in one. but until then, when i have time to be creative - i do it in here. it's elegant with a twist of modern. the first room guests see when they walk through our front door. in the corner, i have a photo & postcard carousel perfect for displaying black & white photos of my little ones. i love that i can easily swap new ones in... and my daughter LOVES to look through her old photos and reminisce of her trips to grandma's, baba's and disneyland. 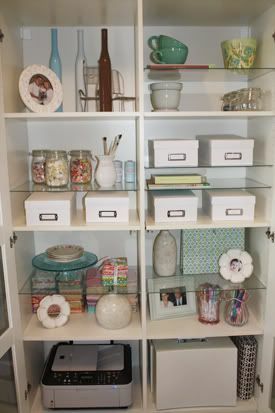 if only it'd stay looking so pristine, my giant bookshelf is home to knick knacks, art & sewing supplies, and office goods. my wireless printer and sewing machine even fit inside! 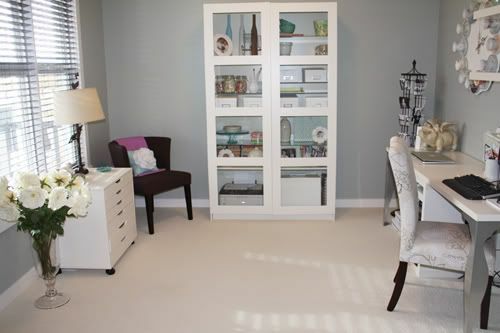 do you have a creative space? what do you love about it? Love your creative space! Especially the tea cup clock. I have quite the collection of antique teacups that the Hubs constantly complains about.....perhaps it would make him happy to see them in a clock? Great DIY project idea....if I ever had the heart to part with 12 of them! You have very neat and clean creative space. I must say great room. I wish I could manage mine as the same.